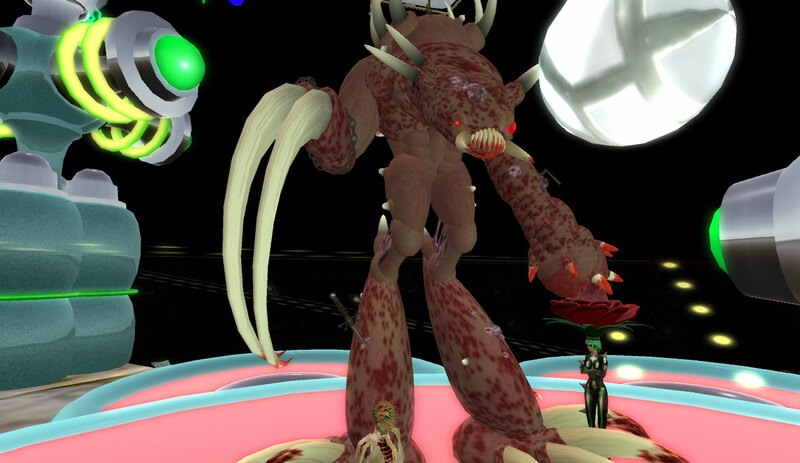 Bryn Oh’s Robo Insects are on display in virtual Vienna’s Natural History Museum in Second Life. Cyberloom went to pay homage with avatar dressed as a steampunk dragon and soon began to feel ‘at one’ with the virtual sculptures. Then, after communing with the ‘Mayfly’ exhibit (above) started to think the Robo-Insects needed to be set free… liberated into the thin virtual air of Second Life. However, dear reader, reason prevailed and Cyberloom switched avatars to view the rest of the exhibition as a more ordinary avatar (wearing steampunk clothing) and somewhat less prone to the emotional over reactions of steam dragons and steampunk robots. Beautiful steam wyrmling (or dragon) created by Daryth Kennedy and available from the Isle of Wyrms in Second Life. I went to visit Bryn Oh’s Immersiva the other night and discovered ColeMarie Soleil was there! She was singing live with her avatar perched atop a giant rusty bird suspended high in the sky. 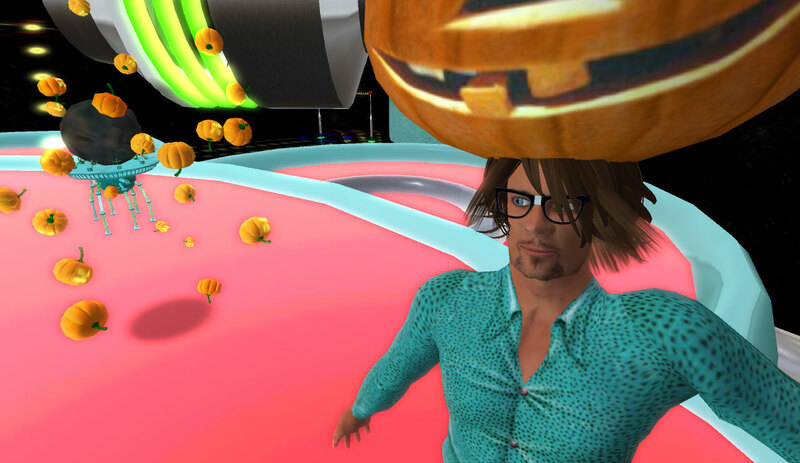 There were some pretty amazing looking avatars gathered round ColeMarie including this one by Kevlar Keen. We finally arrive at the Research Centre for the Study of Interplanetary Organisms. Glyph Graves, one of the mad scientists, presented findings following his intensive 'exploration into the forefront of Organic Transmutation'. The gelatinous 'pet' suddenly sucked Dusty Linden into its squidgy self via aggressive osmosis. Glyph shouted 'ummm don't be alarmed... its just mistaken you for its offspring... they seem to carry them around much like a kangaroo... it should realize its mistake shortly....' Sure enough, Dusty was squirted back out, yet she managed to retain her poise admirably (despite being covered in pastel colored, salt flavored goop). Nonnatus Korhonnen (seen here as none other than Gattina Dumpling) then presented creatures that existed eons ago in 'pre-nonnatus history'. Somehow, Nonnatus had managed to retrieve two small seed fragments from 'the oceans of infinite combinatorial possibilities'. With the help of an 'entirely artificial pulsating red mass' Nonnatus was able to coax fresh new organisms to be brought to life! Bryn Oh then began summoning a Rain Pixie which she described as ' The cutest little thing you have ever seen!' Unfortunately, I am not at liberty to reveal the cute little rain pixie, or the grand finale with the species that stands 8 stories high and can read minds! I am bound by complex laws of Organic Transmutation and Immersive Secrecy, plus I fear reprisals from Glyph Grave's pet... (I don't have the family connections of Dusty Linden after all). Only 10 avatars can take the Bryn Oh’s tour of the Research Centre for the Study of Interplanetary Organisms at one time (more avatars generate too much lag). However, there is a chance to win a visit, and see the cute Rain Pixie, and the 8 stories high mind reader for yourself! Visit Bryn Oh’s blog post ‘4Jetpacks4’ for more information on how finding a Wonka Bar wrapper on Immersiva will entitle you to this magical immersive tour. ‘4Jetpacks4’ is part of the Virtual Art Initiative. As promised in my earlier post (‘Immersed in the imagination and smog of Bryn Oh’) here are some more photographs of Bryn Oh’s abandoned robot theme park on Immersiva. Immersiva is full of mysteries and puzzles, and I don’t want to spoil the surprise for others by saying too much here. I hope these pictures encourage you to visit Immersiva in Second Life™. Best wishes to Dusan Writer, patron (saint) to high calibre virtual artists and Bryn Oh! I had the opportunity to visit NPIRL artist Bryn Oh’s island Immersiva recently. What a strange haunting place it was! It reminded me of the North of England when the coal mines were still working, with their ugly/beautiful slag heaps and devastated landscapes. Immersiva rises out of a cold, gray sea and strange tracks criss cross the island’s foggy, damp landscape. The fog was so dense I could almost feel it prickling my avatar’s delicate lungs. Figures emerged from the gloom here and there, sometimes these were other avatars, and sometimes they turned out to be eerie statues. Bryn Oh requests that visitors follow instructions to set their environmental settings so that they can achieve what could be called Bryn Oh smog-light. I followed these instructions, but then I strayed into playing with the settings in an attempt to render a cold winter’s day with watery sunlight. Immersiva represents a post-apocalyptic world, and the fog helps conjure up an atmosphere of lost hope and ruined dreams. Still, I justify my modified lighting with the thought of how brief spells of sunshine can give additional poignancy to emotional and physical devastation! The artist goes to great lengths to provide extremely precise lighting instructions before abandoning us in the dense fog. (Did you hear that muffled Bryn Oh laugh or was it just my imagination?) I warn you, Bryn Oh smog-light plays tricks on your mind. It is intriguing to be given such specific guidelines, as Bryn Oh has mastered the art of understatement, these initial directions are merely her introduction. She knows how to give just enough poetic information to captivate her visitors. The sculptures do the same, they conceal hidden chambers where secret surprises lurk out of sight. The art of imagination lies in always leaving room for others to bring their own references and questions. Too much guidance and control shuts imagination down, kills it dead. Immersiva is like a strange aquarium where we are held like translucent jelly fish manipulated by an unseen power! More on Immersiva in my next post. In the meantime, take a look for yourself! NPIRL threw a Happy All Hallows party at the Plasmaco Mining Company last night. Check out some of the very cool avi outfits! Scarp Godenot (in the background you can see Yeti Bing and Yoa Ogee). The NPIRL Halloween Party was held at Plasma City ‘The Future That Never Was’. More images can be seen on Flickr.